Arrows signify direction and destination, and at Arrow Physical Therapy & Rehabilitation, we believe the first step to recovery is to set achievable goals and determine the best way to get there. We create individual plans for our patients, and our team walks with you each step of the way on your path to recovery. Just like an arrow, we can find the most direct path for your to reach your rehabilitation goals. Whenever you see the Arrow name and logo, know that we will help put you on a straight path to quickly reach your goals. Our patients experience the Arrow Physical Therapy & Rehabilitation difference every time they walk into one of our New Jersey locations. From our hands-on approach to physical therapy to our constant support throughout your rehabilitation journey, our team at Arrow Physical Therapy & Rehabilitation goes above and beyond to help our patients regain their quality of life. You can read more about the Arrow Physical Therapy & Rehabilitation difference on our testimonials page. 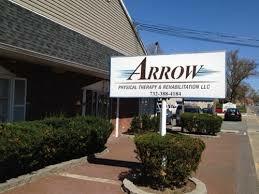 ARROW PTR is an award winning practice renowned as a premier outpatient rehabilitation center in New Jersey. We would like to thank you for choosing ARROW Physical Therapy & Rehabilitation. If you are ready to start your journey toward reclaiming your pain free lifestyle, contact us today to schedule an appointment with our team. We are ready to help you get back to the quality of life you enjoy!